The pungent taste of lemon grass, the creamy richness of coconut milk, the crispness of stir-fried vegetables and the fiery punch of chili have all contributed to the phenomenal success of Thai cooking throughout the world. Subtly combining the flavours of China and India with a dash of its own inimitable style, Thai food is an exotic concoction of rapidly-cooked fresh ingredients, herbs and spices. Quick to prepare, it is an authentically delicious cuisine for vegetarians or indeed anyone seeking a healthier, meat-free diet. 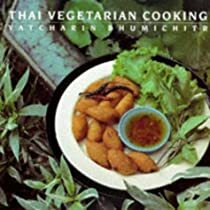 Following his best-selling cookery book, “The Taste of Thailand”, Vatcharin Bhumichitr has put together his own selection of original Thai vegetarian dishes. The 130 recipes range from the seductively delicate “crispy rice with coconut and mushroom sauce” to the more robust and tangy “stir-fried chili with water chestnuts”. There are soups, starters and one-dish meals, and a selection of more elaborate delicacies, including curries, main dishes and desserts to tantalize and captivate the palate. Along with advice on equipment, ingredients and how to plan a full Thai meal, the author also creates an evocative picture of Thailand as he explores the religious and cultural importance of vegetarian food in his homeland. Containing atmospheric location photography and succulent food images, this book is both a travel companion and culinary guide.